We know BPA is bad. We are comforted by plastic products now claiming to be BPA-free. The questions remains, just what chemical replaced BPA in this BPA-free plastic? Is it really any safer? One of the most popular BPA-free options, especially among companies catering to families and health-conscious consumers, was Tritan, a clear, sturdy, heat-resistant plastic that Eastman rolled out in 2007. (Eastman also produces the chemical that sullied the drinking water of300,000 West Virginians in January.) A company founded by alternative medicine guru Dr. Andrew Weil launched a line of Weil Baby bottles made from Tritan, which it touted as “revolutionary” and “ultra-safe” material. Thermos began churning out Tritan sippy cups, decorated with Barbie and Batman. With more and more consumers demanding BPA-free products, Nalgene, CamelBack, Evenflo, Cuisinart, Tupperware, Rubbermaid, and many other companies also worked Tritan into their production lines. Eastman, a $7 billion company that was spun off from Eastman Kodak in the 1990s, assured its corporate customers that it had done extensive safety testing on Tritan. But its methods were questionable. According to internal Eastman documents, in 2008 Eastman signed a two-year contract with Sciences International, another product defense firm that had played a key role in the tobacco industry’s scientific misinformation campaign. On Sciences’ advice, Eastman then commissioned a study that used computer modeling to predict whether a substance contains synthetic estrogens, based on its chemical structure. The model suggested that one of Tritan’s ingredients—triphenyl phosphate, or TPP—was more estrogenic than BPA. The young were hardest hit, and, in one way or another, all of the animals’ symptoms were linked to the endocrine system, the network of glands that controls growth, metabolism, and brain function, with hormones as its chemical messengers. The system also plays a key role in fetal development. Colborn suspected that synthetic hormones in pesticides, plastics, and other products acted as “hand-me-down poisons,” with parents’ exposure causing affliction in their offspring. Naturally occurring estrogens bind with proteins in the blood, limiting the amount that reaches estrogen receptors. But vom Saal found this wasn’t true of BPA, which bypassed the body’s natural barrier system and burrowed deep into the cells of laboratory mice. Vom Saal suspected this would make BPA “a hell of a lot more potent” in small doses. The Mother Jones article is very extensive, and I encourage you to read it. We cannot trust our government or the plastic industry to protect our families. Plastic will never be safe. Conclusions: Many plastic products are mischaracterized as being EA free if extracted with only one solvent and not exposed to common-use stresses. However, we can identify existing compounds, or have developed, monomers, additives, or processing agents that have no detectable EA and have similar costs. 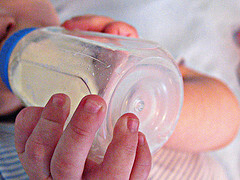 Hence, our data suggest that EA-free plastic products exposed to common-use stresses and extracted by saline and ethanol solvents could be cost-effectively made on a commercial scale and thereby eliminate a potential health risk posed by most currently available plastic products that leach chemicals having EA into food products. BPA free is not EA free. Still, I think I will avoid plastic as much as possible, which is not so easy in our culture.